This is another great salad from the Women’s Retreat. I think this one was my favorite, because you can’t go wrong with lemon, feta and dill. The lemon really brightens up this dish and keeps the orzo from feeling slimy, which can happen with cold pasta salads. This also has great texture from the crunchy cucumber and chewy orzo with the creamy feta. By adding chickpeas you get great protein and fiber, making this filling and a well-rounded meal all on it’s own (whole grain + protein + vegetable = mealtime success!…you know you love my math). Cook orzo according to directions on package. Drain and rinse briefly with cold water. Set aside to cool. 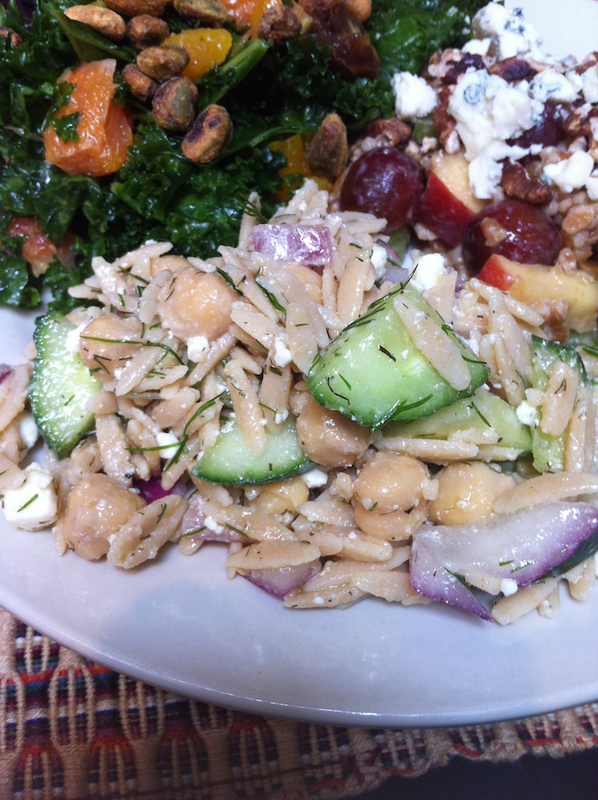 In a large bowl, combine orzo, chickpeas, cucumber, feta, dill and shallot. In a jar or measuring cup, whisk together remaining ingredients. Taste and adjust seasoning as needed. Pour over salad and mix well. Serve at room temperature or chilled.